When it comes to enjoying a perfect glass of wine, it is important to ensure that it is at the optimum serving temperature. Wine is all about enjoying the taste and its wholesome quality. These are two aspects which are highly influenced by how the wine had been stored prior to consumption. When it comes to storing wine it is useful to keep some important considerations in mind. These will help you successfully preserve the taste and quality for the required period. Refrigeration is one of the best ways to preserve your collection’s quality, and for this you will need a wine cooler for the best results. So before you go out and get that wine cooler you have been looking at, let’s first take a look at some of the factors which will help you identify the best fit for your specific needs. We will use these considerations to review the Danby Designer DWC172BL wine cooler which is a great choice for wine enthusiasts who are starting out. Direct sunlight can affect the taste and quality of wine. This is exactly why it is usually stored away from sunlight and in relatively dark wine cellars. This preserves the wine at all times. As a wine enthusiast you will have heard of this but, most people forget about it and should be reminded from time to time. Another important factor to keep in mind is that wine has an optimum serving temperature. To ensure that you always have a fresh supply of great tasting wine is to make sure that you keep it at the recommended serving temperature. 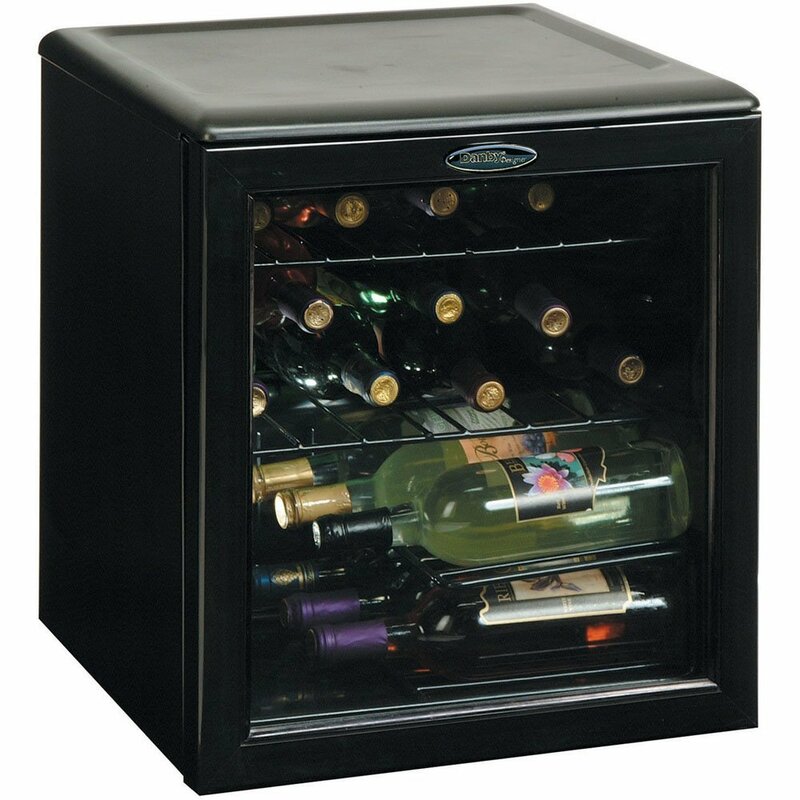 A wine cooler is a great asset when it comes to keeping your wine at this temperature. What does the Danby Designer DWC172BL Wine Cooler Offer Buyers? The Danby Designer DWC172BL is a compact counter top wine cooler that is deigned to suit most modern kitchen décor designs with the black on black build. This means that you do not have to look for space around your kitchen or any other room as it can be easily be placed on top of a counter and fit in with the room décor seamlessly. If you are looking for a unit that will comfortably take a substantial supply worth of wine and preserve its quality over months of storage, then the Danby Designer DWC172BL is your best choice. With a 17 bottle capacity, you can keep your small collection in the best storage condition without risking any deterioration in taste or quality. It is however important to mention that storing broad shouldered bottles in this unit will reduce the capacity as the shelves are specifically designed for regular 750ml bottles. White wines and red wines have different optimum storage and serving temperatures. This may mean that this single temperature unit is suited to the storage of one wine variety. However, the bottom layers usually have a temperature difference when compared to the top shelves. This means that buyers can enjoy dual zone functionality even with the unit being designed and priced as a single zone cooler. You can be sure that your whites and reds are always well cared for with this unit in use. If you are looking for better functionality in this regard then you will be best suited to buying a dual zone unit. This type of unit will accommodate both reds and whites comfortably with different settings for two different compartments. The unit also comes with two slide-out shelves for easy and convenient viewing of the bottles stored within. All you need to do is pull out the shelves and inspect the available selection before picking out your favorite. This unit definitely comes with some limitations especially when it comes to storing both red and white wines with it being a single zone unit. It is also designed to take smaller 750ml bottles, with larger ones reducing its capacity. It is however important to remember that it is designed for wine enthusiasts who are starting out their collection and buying a larger cooler which would be underutilized would be a waste of resources. At its price, the available features make it a steal, and the compact nature make it great for wine enthusiasts with space limitations. This single-zone wine cooler from Danby is capable of storing plenty of wine bottles while also using a small body. This body is capable of controlling the cooling process with ease. It also fits in well within many different spots in any home.